As a trier-of-fact, an expert's opinions and methods are expected to survive peer review and courtroom challenges. In a court of law, the professional expert work and opinions of an Audio Video Forensic Analyst (AVFA) may need to withstand a Frye challenge, and their Curriculum Vitae (CV) may need to endure a Daubert challenge, since it is the Court who will determine if those opinions will be entered into the record as expert assessments. The need for these professionals to have their knowledge and skills validated with an accredited certification was brought to the attention of ETA International by experts working in the field. Together, ETA and Subject Matter Experts (SMEs) developed the stringent competencies that the AVFA must obtain in order to be acknowledged and respected as a courtroom expert in accordance with industry standards and best practices. As an AVFA, the professional must be able to evaluate, authenticate, and enhance the auditory and visual contents of analog and digital media using modern electronic technology. A certified AVFA is expected to have the required training, experience, knowledge, and skill to perform these required professional tasks. Achieving the prestigious status of an ETA-certified AVFA requires passing a comprehensive proctored exam, developed and revised through a rigorous and extensive peer-review process. 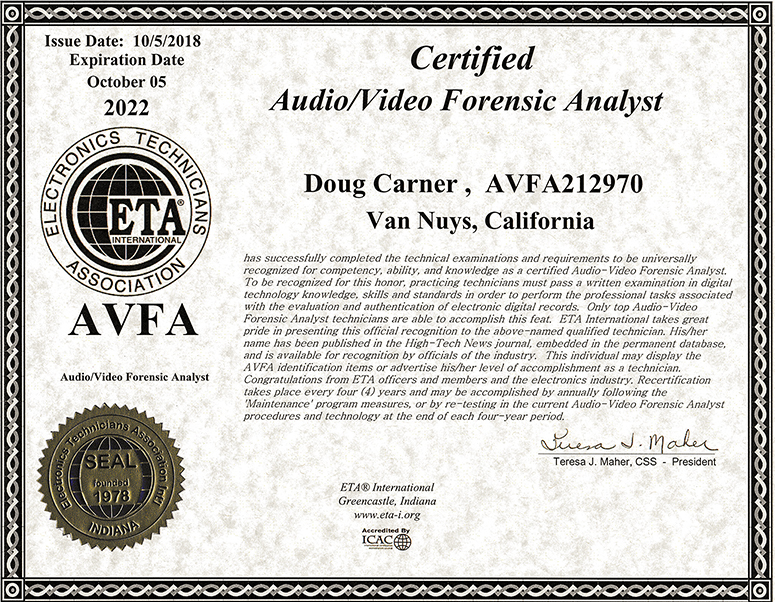 AVFA certification is verification that the expert possesses extensive audio-visual enhancement and authentication industry knowledge, and it is the industry's first such peer-reviewed forensic certification. ETA International is proud to offer the AVFA certification, accredited by the International Certification Accreditation Council (ICAC). ETA, a non-profit professional trade association dedicated to the electronics industry, offers a special thanks to the following professional Audio Video experts for their advice and dedicated efforts in developing this new certification exam: Marisa Dery, Doug Carner, and Jennifer Owen.